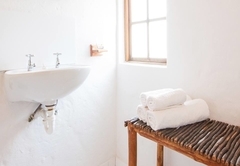 Cypress Cottage is a highly recommended Swellendam Bed & Breakfast providing accommodation in 6 guest rooms for tourists visiting the Cape Overberg region. 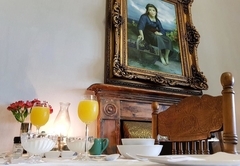 Etienne and Vera welcomes you to Cypress Cottage, a historical retreat, one of Swellendam's oldest and proudest establishments. 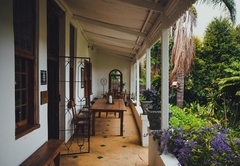 Experience the charm and secluded enchantment of this historic 18th century Cape Colonial homestead, build more than 200 years ago (1796). 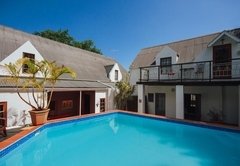 Enjoy a magnificent country experience set in lush gardens with century old Oak trees and a sparkling swimming pool, reflecting all the moods of country living. Wake up to the sound of birds in the comfort of your stylishly furnished en-suite bedroom. 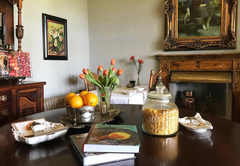 The highlight of your stay will be the hearty country breakfast that is served in the elegant dining room or Victorian veranda overlooking the beautiful garden. 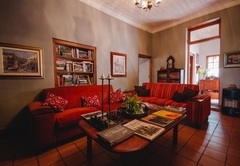 Accommodation consists of six elegantly furnished en-suite and very spacious bedrooms with their own private entrances. These stylish rooms all have colonial charm and themes range from traditional African Safari, Cape Colonial to Victorian splendour. Consists of two separate inter leading rooms and a bathroom, the one with a double bed and the other with three single beds. This unit also has a lounge area with a fireplace. They have a balcony overlooking the swimming pool area. 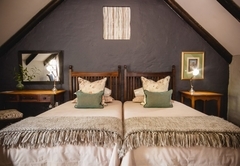 The African room (sleeps 3) is furnished with twin beds (3/4 beds) and an extra single bed. 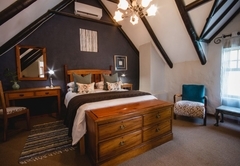 The Colonial room (sleeps 3) has a Queen size bed and an extra single bed. Consists of a double bed and separate living area. 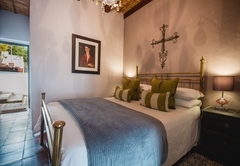 This room has a King size sleigh bed, Victorian bath and a private garden. This room has a Queen size Victorian bed overlooking the tranquil front garden. All the bedrooms have the necessary amenities, comfortable mattresses, percale linen, tea and coffee facilities. 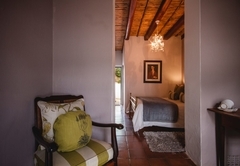 The bedrooms are further equipped with air-conditioning, fridges and electric blankets. Safe, off the road parking bays are conveniently situated at your doorstep. Children and pets are most welcome. 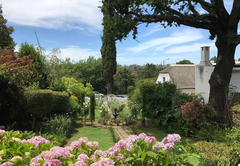 Swellendam, the third oldest magisterial district in South Africa, nestling in the foothills of the majestic Langeberg mountain, is a charming town with a fascinating history. 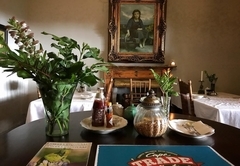 Strategically situated on the N2, approximately 240km from both Cape Town and George has much to offer visitors interested in heritage and culture, architecture, wildlife and outdoor adventure. 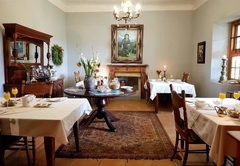 It is also an ideal base from which to explore the neighboring Southern Cape, Breede River Valley and the Klein Karoo. Classed as our "bridal or honeymoon suite". Victorian King size bed with full en-suite bathroom. Original Yellow wood ceilings and English piano. 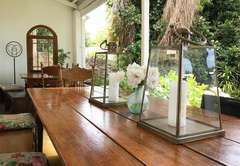 Located on the front veranda overlooking the beautiful French garden with century old Oak and Cypress trees. 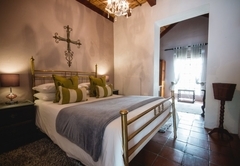 A beautiful Cape Colonial room with original Yellowwood ceilings and doors. 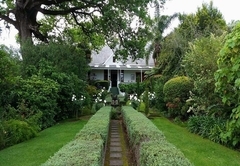 Features your own private garden, King size extra long Slay bed with Victorian bath. 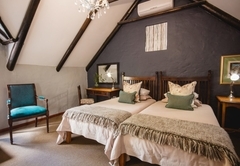 Our African room is air conditioned and has twin (3/4) beds with an extra single bed. Decorated with Nguni cow hides and leather couches. Located on the balcony overlooking the sun terrace with sparkling pool. 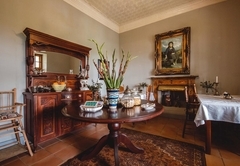 Colonial & African rooms form family suite. A beautiful and comfortable room (air conditioned) awaits your stay - Queen size bed with extra single bed. Located on the balcony overlooking the pool area. The Colonial and African room could be used together as a family suite. The business man's room of choice. 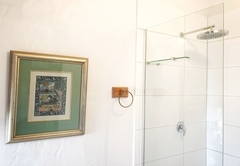 Also located in the old horse stables with old Brass double bed and nicely appointed small sitting room with full en-suite bathroom. 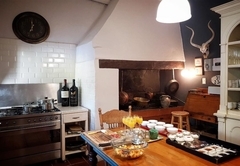 This very popular Family unit consist of two separate interleading rooms, with double bed and the other room with two single beds, big wooden baby cot and lounge area in front of the old fireplace. 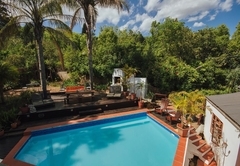 The best place to be in Swellendam!!! 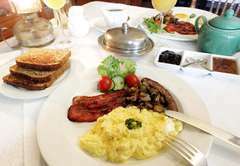 An old but perfect house, great breakfast. Etienne, Vera and their daughter are wonderful hosts. My third and I hope not last stay there. Response timeCypress Cottage typically responds to requests in 5-10 minutes. Child policyChildren of all ages welcome. Cots and sleeper couches available. Family suites available. Baby-sitting can be arranged as well as dinners on request.